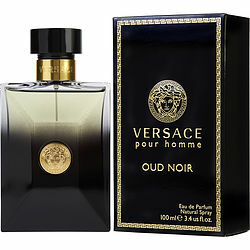 A spicy, woody scent that lingers like smoke in the night air, Versace Pour Homme Oud Noir invites mysterious glances and intrigue to the man who wears it. Launched in 2013 by the renowned house of Versace, this high-brand men's fragrance is a strong but seductively subtle blend of oriental woodsy notes. It mixes the raw scents of leather and rich agarwood, a highly prized aromatic resin from Southeast Asia, with spices and woods. Wear this lasting fragrance for a distinguished appeal.